The picture below sure doesn’t look like an ancient Greek temple. Nor does it look like a Romanesque cathedral. Instead of focusing on the simplest forms, this carving revels in sheer abundance. 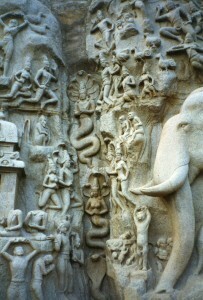 This is the middle of a 152 foot long frieze in southern India–in Mahabalipuram, 45 miles south of Chennai (it was originally called Mamallapuram, meaning city of the great wrestler). The kings of the Pallava state commissioned these carvings in the 7th century, and used them as statements of political and spiritual unity. But this unity was expressed with very different aesthetics than Greek temples’ and Romanesque art’s. What the heck is going on in that crowded scene? 1. It either represents a story from the Mahabharata in which Arjuna (the hero in the Bhagavad Gita) practices austerities in order to persuade Shiva to give him a weapon called the pasupata. 2. Or it’s about the descent of the Ganges River, which was originally up in the sky. The cleft you see in the middle is where it would have landed. 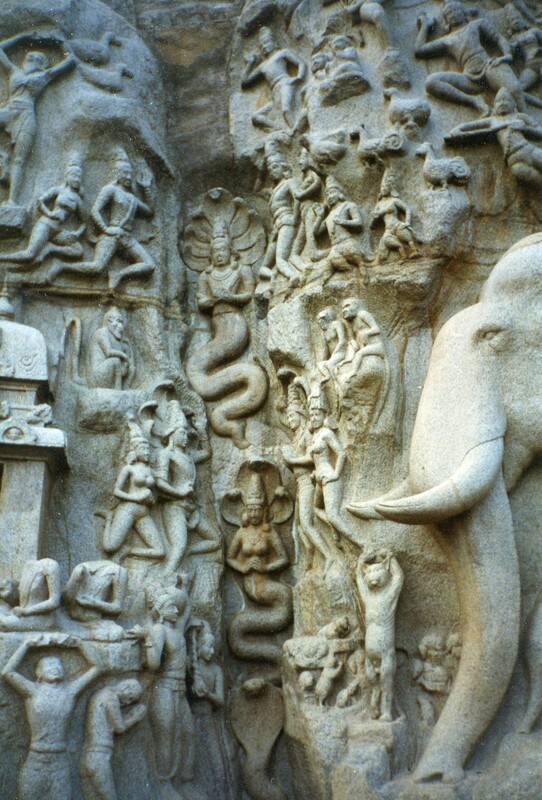 Nagas undulate in the middle of it, and many creatures face it–many features of the frieze thus support this interpretation. 1. The characters are in motion. They’re not static, like Greek sculptures. 2. The characters are integrated with many others, and several species are mixed. All life forms are unified in an enormous flow of energies. 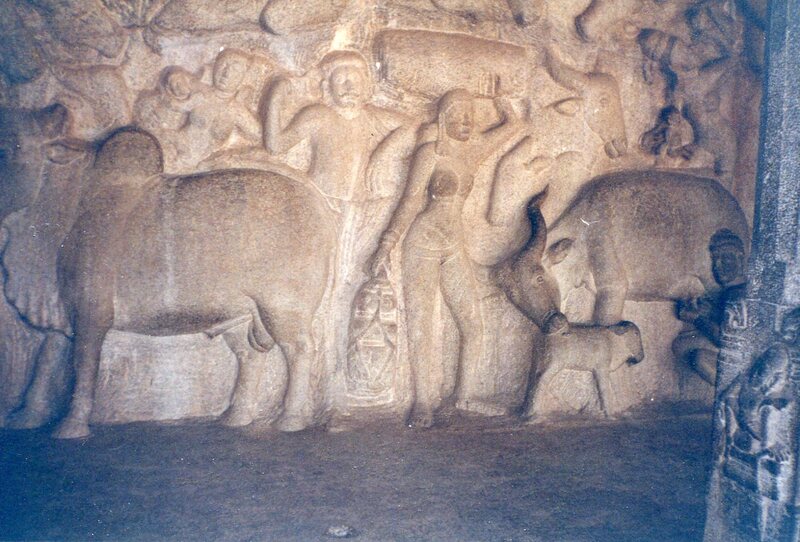 The above photo is also from Mamallapuram. It lovingly shows a man milking a cow while she licks her calf. This scene could be of rural India today. But many other beings surround them, and all gently flow together. Western artists have usually partitioned scenes into separate narratives. But Indian ideas of unity have more often been expressed in panoramic perspectives in which everything flows together. One of the reasons is the unique nature of many Indian stories. We’ll see this in the next post.